Hi! Long time no see. We’re still alive and we definitely still make games. 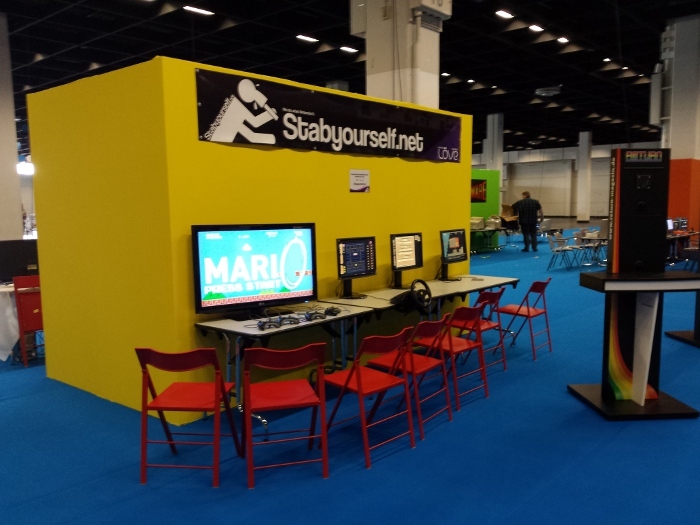 We’re exhibiting at Gamescom in Cologne, Germany once again! 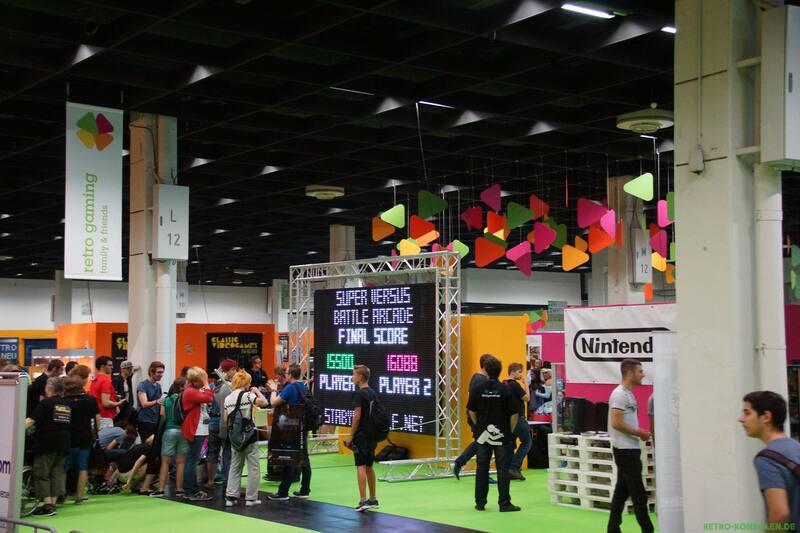 Gamescom is as usual sold out at this point, but if you’ll be there, visit us in Hall 10.2 at column K12 and say hi! This time we have a special treat: we made our own Super Battle Arcade machine! It’s pretty fancy if I do say so myself, and we made sure the screen is bright enough so everyone can see the game. Turns out everyone with a line of sight absolutely can see the game. The arcade machine is one of a kind, but depending on interest we might consider turning it into something - it’s popular with the players at the very least. We’re uploading new photos of the event to our Flickr daily check them out. We’re planning to get a proper video of the machine ready as well, so stay tuned for that. As for Not Donkey Kong: it is in development and it’s pretty ridiculous already. More information on Not Donkey Kong coming soon. First of all, before anything else, if you’re reading this: Thank you very much. The fact that you are reading this means that you still think of Stabyourself.net, founded with only two people a little over three years ago, which is incredibly awesome and humbling. There are plenty of small game developers like us around and having an actual audience is an honor. So, first of all: Mari0 SE is cancelled at this point. Making Mari0 was a great experience that we won’t forget, and the positive (and some of the negative) responses we received will stick with us for a long time. 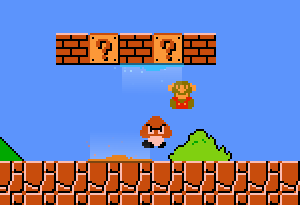 The reason for this inevitable announcement is that as SE grew with planned features, issues started to pop up that would either require even more code duct tape or a complete recreation of the game, which is frankly more work than we are willing to put into it - Mari0 was, after all, started only as a test Super Mario Bros. clone that had portals added because the idea sounded neat. At this point creating what is essentially a sequel is not a commitment we can make - especially not one that we would be satisified with. We’re sorry if you’re dissapointed about this, and we’re sure a lot are. Perhaps some different decisions in the past would have led to SE actually being released, but at this point Mari0 is shelved for good and it might be for the better - there is only so much you can do with a mashup of different games. If you really want to take a look at SE, we have released some betas on the forums during the development of Mari0 SE which were compiled by a user on the forums. Feel free to try it out, but keep in mind it is basically in alpha state. Gamescom 2015! 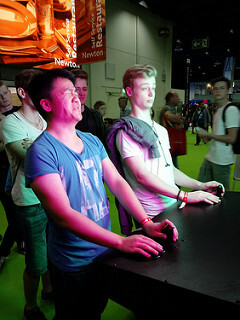 As we wrote in the last blogpost, we once again visited Gamescom in Cologne with our usual games lineup but also developed a game specifically to be played on an LED wall with 2 players. The reception we got was amazing and that’s the stuff that we run on. It’s not about money for us (the devil has yet to tempt us), but about seeing people have fun with the games we create (even if that means pouring our own cash into making it happen). It was an awesome week that we are hoping to be able to recreate next year. 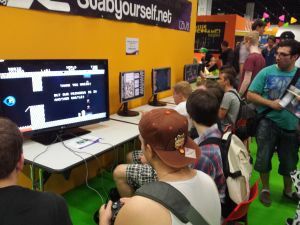 There’s also been some interest that we provide the whole package (LED wall, the controller and the game) at other events, so we’ll see how that works out too. Might be an interesting thing to look into. You can find an album of pictures we took here. One last thing you may be wondering is what we’ll be doing in the future. In the short term, not much. We have fairly recently started workin full-time so we still have to get used to that before we can go about and crunch out a game again. It’s mostly about having motivation, inspiration and a lot of time. We would love to make another big game like Mari0, but you can’t exactly plan popularity. An original project is a lot more likely. Thanks again for sticking with us for so long. We hope to have some good news for you soon. We have had a pretty cool idea in our minds for almost 2 years, and this year we managed to realize it with outside help. 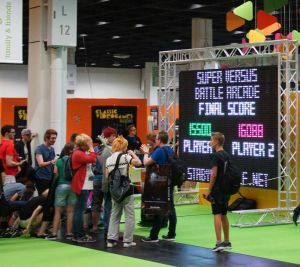 We are happy to present Super Versus Battle Arcade, a collection of retro games adapted to be played on a huge 3,6 x 2,4 meter LED wall (170 inches diagonal with 96 x 64 resolution). The wall of games will be playable until the end of Gamescom 2015 in Hall 10.2 in the Retro gaming area (you won’t miss it, trust me on that). Please excuse the quality of the video - live recording is not quite our thing. We will try to get a much better video going in the next few days, but it’s hard to actually capture just how massive and bright the wall is when you’re actually playing games on it. We’re baaaaack! It’s again our time to confuse the general public with games they think they know but don’t exactly work like they think they should. We’ll be posting pictures again and we’ll also tweet about new SMB TT records - we hope to break last year’s 974 replays. For more information, check here! Hey everyone! As part of my bachelor thesis that I have been writing I have developed a simple game prototype that you can now play. It would be super great if you could download the game and then fill out the survey. Don’t expect a full game, though. Hey everyone! Long time without a blogpost, we know, and we’d like to apologize for that. We have been really busy with our personal lives and only occasionally had time to work on Stabyourself.net related things. We’d like to promise more frequent updates, but it might be another while until we have something new to post. In other news, a man known by the name of moshboy compiled 100 free indie games into one big torrent and called it The Pirate Bay Bundle. One of the games is our game “Trosh” and there are a lot of other great games in the bundle as well, so you should check it out. Earlier today we updated the OSX downloads of Mari0, Not Pacman, Trosh and Order of Twilight. So if you upgraded to OSX 10.9 and want to get back to wasting time, go ahead and redownload those games! Credits for the Not Pacman port go to Felix Dumenil. That leaves Ortho Robot and Not Tetris 2. Ortho Robot is really not a problem but I want to update the game a little and thought this would be a nice occasion. As soon as I have that done I will update all downloads for it. Not Tetris 2 is a little trickier because one of the box2d (the physics engine) functions got removed and I don’t feel like reprogramming big parts of that game right now. There’s an effort to do it by someone else though, so maybe that’ll get updated for OSX 10.9 soon as well. If you have any problems with the new OSX versions, drop a comment or send us an email so we can fix that as soon as possible! So around 3 days ago, Apple released their newest OS to the X called Mavericks (10.9), and it breaks every game on this website. We are aware of this and will hopefully update all the OSX downloads with a fix very soon. I might actually take the opportunity and update at least some of the old games a little, we’ll see. Until then! Some time ago, I added animated tiles which loop through frames endlessly and can add a lot to a mappack if done right. Yesterday I went and made those tiles triggerable with the input/output system in Mari0 and now you can do quite a lot with them. This can be done completely with the tools Mari0 SE gives you. No programming or modding required. To set the delay and whether the tile should wait for a trigger or loop forever, there’s a .txt file next to the image. The [!] 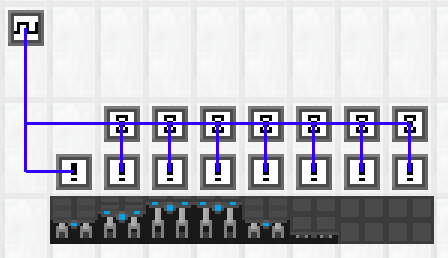 blocks are animated tile triggers, the things above them are delayers which delay an input for X seconds, and the thing at the top left is a square wave input (which just stays ON for X seconds and then stays OFF for Y seconds). The triggers can trigger more than 1 tile at once, don’t worry. I just had to use one trigger per tile for this wave effect. So the square wave starts sending a signal which is delayed between each trigger by a small amount of time, and the triggers then switch between “on” and “off” all the time, which plays and reverses the animated tiles. Additionally, there’s an AND gate in the gif so the button toggles this whole thing. This is all made ingame. So there you have it! Animated tiles which you can trigger however you want and then have them part of puzzles or whatever. Bonus gif! Using another square wave input and a NOT gate. While we were at gamescom, the people of the Pandora, which is a linux based handheld, had a booth 50 meters from us. At one point one of them, PitSeb, came over to us to show us that he ported Not Pacman to his Pandora (You can read about that over here). Since then, he has created a package for Mari0 so that if you find yourself in the possession of such a device, you can now find Mari0 in the Pandora repo. PitSeb also made packages for Not Tetris 2 and Not Pacman, so if those are more your thing you can get them as well!